peel the boiled potatoes and cube into small pieces. heat oil in a pan and add nigella and green chilies and stir. when nigella star to crackle add ginger and stir for a minute. now add chopped potat and salt and cook for 2-3 minutes on medium heat. 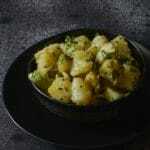 Add chopped coriander and serve hot with luchi or parathas. You can add a pinch of sugar if you wish. Traditionally turmeric is not added but you can add a pinch if you want a slight colour in it. can use panch phoron for the tempering for a variation in taste.